Click HERE to access an interactive map of the former Northern lines of the Adelaide tramway network. 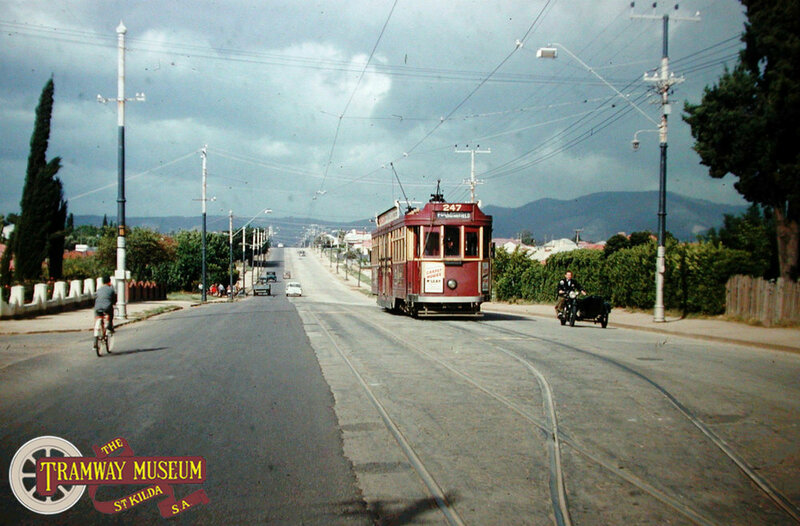 A Cheltenham bound F1 type 'Drop Centre' tram can be seen running up what was then Government Road (now South Road) having turned out of Hawker Street. This section of South Road is now much busier compared to in tramway days. Photo: Keith Kings. Horse trams never went beyond Hill Street, North Adelaide, but electric trams reached Bowden in 1912, Croydon in 1923 and Kilkenny in 1929. With Australia into the Second World War in 1939, munitions plants were developed at Finsbury, working day and night. In 1942, a long tramway extension was laid in a single track with a barely adequate power supply to Cheltenham to serve them. After the war, additional power was provided, and trams were able to run special services to Cheltenham racecourse. At the same time, there was much infill of the vacant land between Kilkenny, Woodville, Rosewater and Port Adelaide with new housing. New bus services for these areas connected with trams at Woodville North and Cheltenham. Buses replaced the trams after the last tram ran on 22 November 1958, and ran through to Port Adelaide. F type 'Drop Centre' tram 219 at the Prospect terminus at the intersection of Prospect Road and Irish Harp Road (now Regency Road), c.1954. The photo is taken looking north with the then new suburb of Kilburn in the background. Trams on the Prospect line ran through the City to the southern terminus of Mitcham. Electric trams replaced horse trams, running on Prospect Road to Farrant Street, in 1911. In 1924, the line was extended to Irish Harp Road (now Regency Road), and a small shopping centre developed. However, the extension was cancelled and buses took over from July 20 1958. The local shopping centre at the former Prospect tram terminus still remains today much as it was in the tramway era. F type 'Drop Centre' tram 220 at the Enfield terminus at the intersection of Main North Road and Irish Harp Road (now Regency Road), looking towards the City, c.1951. Enfield trams ran through the City to Col Light Gardens. In 1883, the Adelaide, Prospect, Nailsworth and Enfield Tramway Company opened a horse tram service from Rakes Road (now Regency Road), Enfield to connect with the Adelaide and Suburban Tramway Company’s at the Caledonian Hotel, North Adelaide. Shops grew up along side the Great Northern Hotel at Enfield. Electric trams arrived in 1911. But by the mid 1950s, expansion went far beyond this area and buses had run from Enfield terminus at Irish Harp Road, (now Regency Road) to Gepps Cross and beyond from 1944. The decision was taken to establish the newly planned city of Elizabeth in 1955. Buses replaced trams from 8 December 1957, initially running on to Gepps Cross, but now also going to Salisbury and Elizabeth. Today the scene is completely changed, with the local shops and the Great Northern Hotel replaced by a tavern and giant supermarkets serving as a major retail centre. The old 1950s Enfield terminus is now unrecognisable. F1 type 'Drop Centre' tram 283 is seen climbing to the top of Smith Street in Walkerville with a service to Walkerville North. Beneath the central cab window is a sign showing that this tram will be making a connection with a Gilles Plains bound bus service. Photo: Keith Kings. With the success of the horse tram service running to Kensington, the Walkerville Council approached the operators of that line (the Adelaide & Suburban Tramway Company) to build a tramway to serve Walkerville. Construction of the line started in July 1882 and the four and a half mile line was opened by November that year with the terminus at the bottom of Smith Street. The line to Walkerville was one of the earliest lines to be converted to electric traction with the new electric trams commencing service in April 1909 to the former horse tram terminus. By January 1911, the Walkerville line had been extended to terminate at the intersection of Smith Street and North East Road. 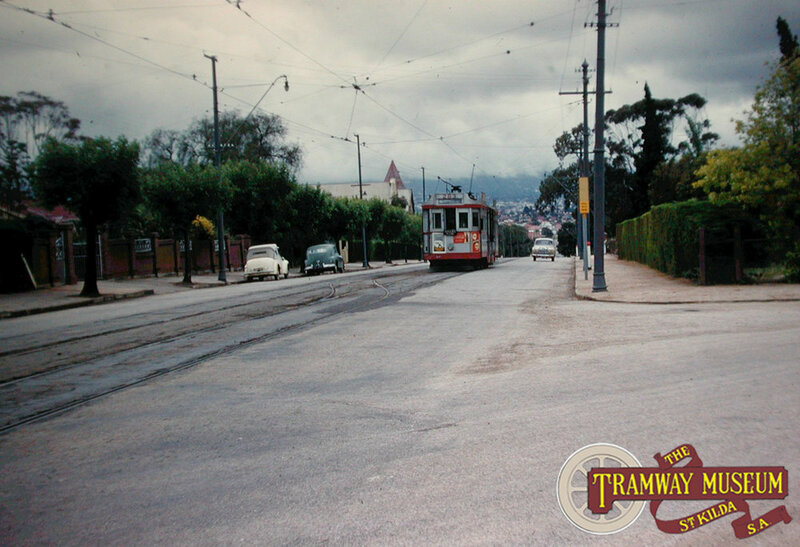 With continued developement of the north eastern suburbs, the tramway was extended a third time up North East Road to terminate at Lansdowne Terrace (opposite the Hampstead Hotel). The new extension to Walkerville North was opened on the 28th of September 1924. As the suburbs continued to expand further and further out, the tram service wasn't extended to meet the newly developed areas. A new bus service was introduced in 1926 which eventually extended through to suburbs like Broadview and later still Northfield. Another bus service was also introduced serving Gilles Plains. Both of these services connected with the Walkerville North tram service where passengers would transfer to the tram for the rest of the journey to the City. In the final years of the Walkerville North service, the number of passengers using the trams was such that over crowding become a major problem. Trams running late and missing the bus connections were another problem. After the tram service ceased in November 1955, these bus services were run straight through to the City. 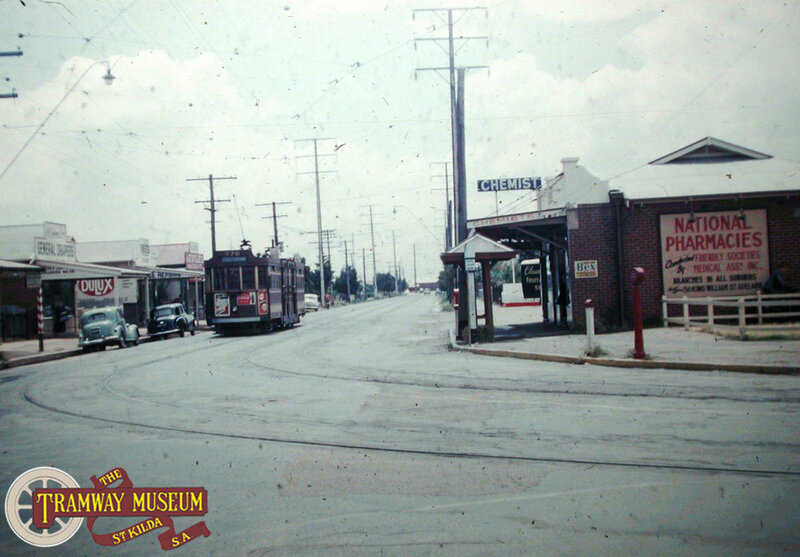 Leaving the second St Peters terminus at the intersection of Sixth Avenue and Lambert Road is D type tram 121 on a working towards the City in the mid 1950s. Photo: Noel Reed. In December 1883, a new company, the Adelaide Payneham and Paradise Tramway Company Limited, commenced its City Payneham line, running from the Adelaide Railway Station, via North Terrace and Payneham Road to Payneham. On 13th November, 1889 this same company commenced a branch of the Payneham horse tram service, from the Maid and Magpie Junction via Baliol Street, Rugby Street, Harrow Road and Fourth Avenue to a point just east of Walkerville Road (crossing the Walkerville Road line). A connecting line along Fourth Avenue and Winchester Street allowed trams to proceed to and from the Depot on Payneham Road. As with the Walkerville Road line, a through service to the City operated only during peak periods. 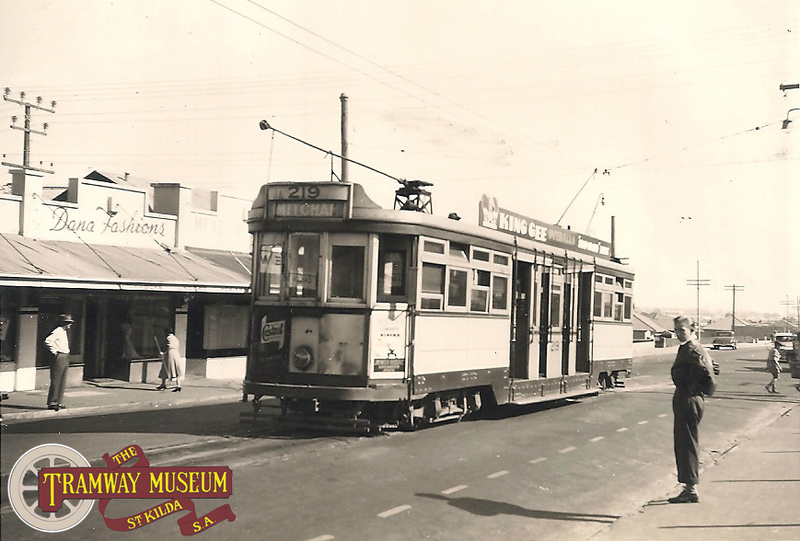 Fourth Avenue trams (generally a small single decked one horse car) met City-Payneham Paradise trams at the Maid and Magpie at other times. February 1907 saw the takeover of the horse tram services by the new Municipal Tramways Trust. Thus, all tram services in the St Peters area were thenceforth provided by one organisation. The M.T.T. commenced conversion from horse to electric power, the Payneham electric tram line opening in May 1909. The Fourth Avenue service was maintained as a feeder service by horse trams and horse buses until 1911. It is not known when the Walkerville Road line was closed, but this was probably just prior to the opening of the Payneham electric tram line. On 23rd July, 1911 electric trams operated to St Peters from the City (ex Glen Osmond) via King William Street, North Terrace, Payneham and Harrow Roads and Fourth Avenue to Walkerville Road. By 1924 it had become apparent that the line along Fourth Avenue did not satisfactorily serve the whole of St Peters. In May, 1924 therefore, the St Peters electric tram line was re-routed via Harrow Road and Sixth Avenue to Lambert Road, St Peters. The change in route resulted in the destination sign "ST PETERS VIA SIXTH AVENUE" appearing on trams until the mid 1950's. The St Peters line was one of the last lines to close with the final tram services ceasing in July 1958 with buses replacing the trams. A feature of the line to Paradise was the long length of single track with a number of 'passing loops' to allow trams from opposite directions to pass each other. F type 'Drop Centre' tram 247 is seen traversing one of these loops on a service heading to the City and eventually Fullarton/Springfield. Photo: Keith Kings. Paradise was put on to the tramway map in 1884 when the Adelaide, Payneham and Paradise Tramway Company opened a horse tram line running along Lower North East Road. Conversion of the line from horse to electric traction took place after the formation of the Municipal Tramways Trust with services initially commencing to Payneham in May 1909 and eventually the new electric tram service terminated at the intersection of Lower North East Road and George Road by November 1911. Although the area has now been suburbanised, the area around the outer portion of the tramway right up until eventual closure (and for a few years afterwards) was noted for being lightly populated with market gardens being part of the landscape. The low traffic density meant that while other lines that were of a similar length were mostly double tracked, the line to Paradise was noted for being single track for most of the line with a number of 'passing loops' built to allow trams to pass eachother. Paradise trams were 'through routed' with services running to Fullarton/Springfield and the line to Paradise was closed in July 1958. In the years following tramway closure, the north eastern suburbs extended rapidly with the market gardens that could be seen from the trams now replaced with houses.